For professional rock climbers, El Capitan, the majestic, vertical rock formation located in Yosemite National Park in California, is close to the top of their Must Do lists. The nearly solid granite monolith rises about 3,200 feet (almost one km) from its base to the summit along its tallest face. Over the past 60 years, both men and women have scaled its sheer face, either with the aid of ropes and bolt holes or by free climbing (where ropes may still be used to protect against falling) but, until June 3, 2017, no one had ever conquered the mountain by free soloing it – without any protective equipment. 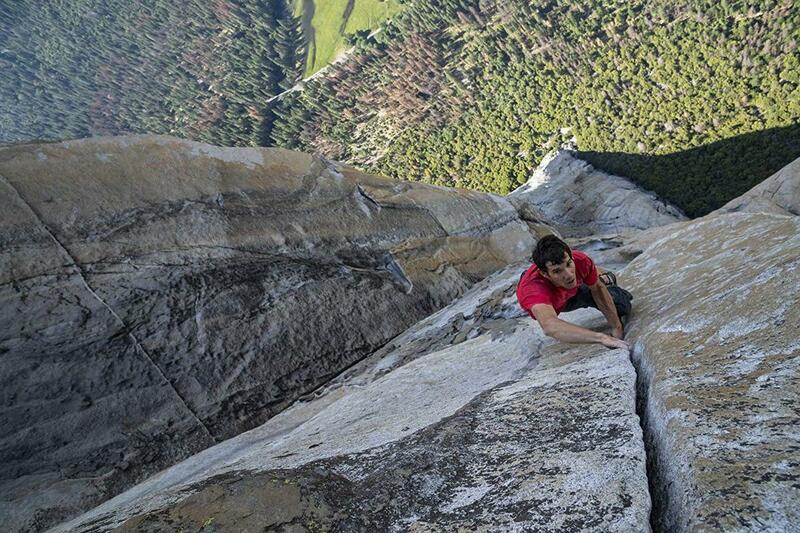 That’s when 31-year-old Alex Honnold achieved what was thought to be impossible… and he did it in an amazing time of three hours and 56 minutes. His feat is chronicled in the Oscar-winning film for National Geographic, FREE SOLO. Husband and wife documentary filmmakers Jimmy Chin and Elizabeth Chai Vasarhelyi have created an intimate portrait of this human Spider-man that is compelling to watch both for Honnold’s physical achievement and for their own technical achievement in being able to capture the event and everything leading up to it on film without being a disruption to climber. In free soloing, there is no margin for error as one misstep can have fatal consequences. While that reality doesn’t seem to phase Honnold, and we learn in the film a possible reason why it doesn’t, it does his girlfriend, Sanni McCandless. Theirs is a curious relationship as she tries to socialize him (she convinces him, for example, to move out of his van and buy a house), but at the same time she knows that for now, at any rate, free soloing is more important to him that she is. Watching them together, one has to wonder what she’s getting out of the relationship and if it will last. Not surprisingly, the film features some absolutely breathtaking and often nail-biting footage as we watch Honnold first work out his plan of attack using ropes and then climb the mountain’s face using just his hands, feet and a whole lot of core strength. When he gets to the point in the wall where he has to execute a precision karate kick to move forward, you may find yourself turning your head away from the screen in fear of seeing what may happen if he doesn’t nail it. He does though – not a spoiler – and his athleticism and composure are beyond amazing to witness. FREE SOLO premiered at the Toronto International Film Festival last September where it picked up the People’s Choice Documentary award. Since then, it went on to take four Critics’ Choice Documentary Awards, a BAFTA and, finally, the Oscar a few months back for Best Documentary Feature. While you can watch it on all the major streaming services, this is a film that deserves to be seen in a cinema. In some markets, it’s also available in IMAX format and that’s an even better option. Sadly, the IMAX option isn’t available to Kong Kong audiences and, in fact, it’s only showing in two cinemas here and only once or twice a day. I highly recommend this film. As Vasarhelyi said in her Oscar acceptance speech, FREE SOLO is for anyone who believes in the impossible. So true!